Now you can see your marketing results whenever you log into Shopify. For a long time, UTM data wasn’t given much love by the Shopify dashboard but that’s not the case from today. Now you can see a summary of your campaign results right from the dashboard. And as of today you can get a summary of your campaign results. There’s definitely opportunity for more detail in the future but I’m sure this is just the beginning of their support for UTM Links. As you know, I’m a long term advocate for UTM Links. 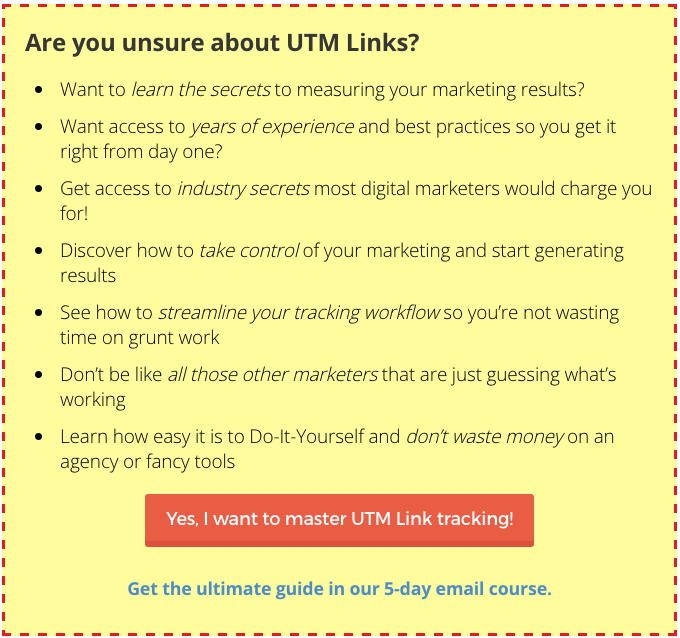 In fact, I created a 5-day UTM Link course for taking eCommerce entrepreneurs and marketers like you from interested to expert. There’s no better way to track your marketing results across the dozens of tools required to run a solid eCommerce business (eCommerce ain’t as simple as some people seem to think). With proper UTM tracking, you can stop guessing where your results are coming from and start doubling-down on the winners and discarding the losers. eCommerce marketing shouldn’t be about guesswork! Always great to see Shopify adding features that make it easier to run your eCommerce store, the right way! If you’re thinking about opening a Shopify store — use this link and we’ll send you a bunch of free resources (just email me to let us know). You can find out more about the feature in Shopify’s announcement.